Over the past 25 years Judith Saunders has published poetry, humor, and reviews in a wide variety of periodicals. Recently her work has appeared in The Mathematical Intelligencer, Blue Unicorn, South Carolina Quarterly, The Christian Science Monitor, Chiron Review, and Snowy Egret. She is the author of two prize-winning chapbook collections of poetry. 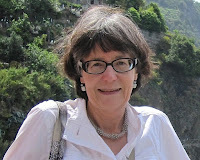 A long-time resident of the Hudson River Valley, she is Professor of English at Marist College. 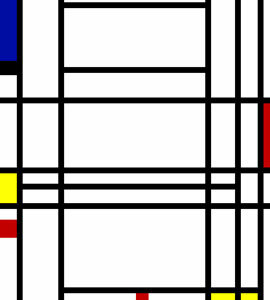 Mondrian left much undone in 10 . . .
from this study in unfinished business. a subject, delineate a theme. into worlds of red, or yellow, or blue. it conforms to no known shape. It could almost be a boat or blimp. the world’s largest water toy, over-inflated. monotony of Dia-Beacon, this factory-turned museum. when they tire of living in a yellow submarine. to ferry us all to the Summer of Love.